Check tx.ag/aggiemomsevents throughout the year for events. Contact 1stvpmembership@aggienetwork.com with questions or to be adopted by an Aggie Mom Club. 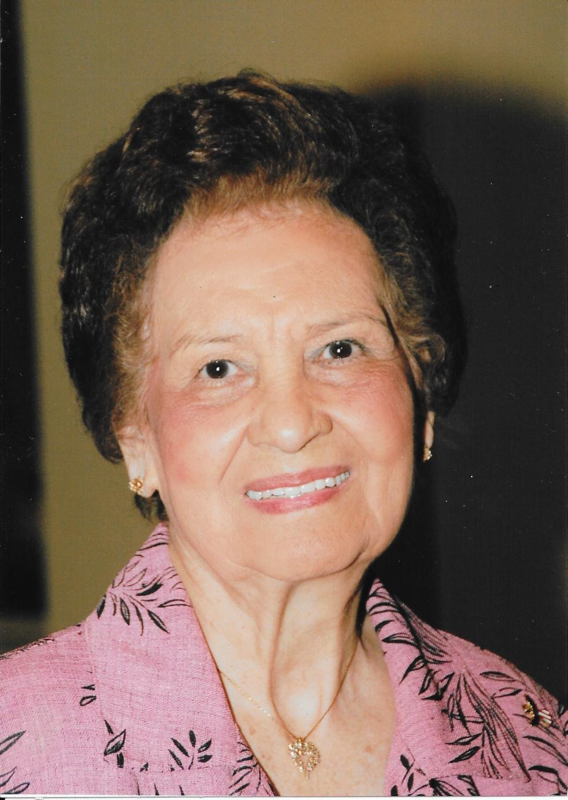 The Federation of Texas A&M University Mothers’ Clubs was organized in 1928 and has grown to include 108 individual Member Clubs located across Texas and throughout the nation. The mission of our organization is “by individual and united effort to contribute in every way to the comfort and welfare of the students and to cooperate with Texas A&M University in maintaining a high standard of moral conduct and intellectual attainment”. Texas A&M University Mothers’ Clubs are proud organizations, proud of Texas A&M University and proud of the daughters and sons they send to Texas A&M. Aggie Moms are also proud of making a contribution: to the education of their students, to the future of Texas A&M University and to the future of the Great State of Texas. We invite you to join an Aggie Moms Club in your area. 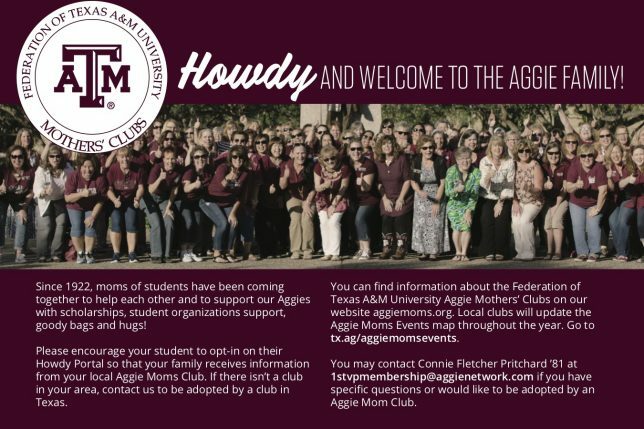 Joining and participating in club meetings and events are excellent ways to become familiar with Texas A&M University, to support your Aggie, and to form lasting friendships with other Aggie Moms. Join our Facebook Group! Be sure to answer all of the questions for a speedy approval. Being an Aggie Moms makes you a part of a remarkable organization that connects you with thousands of women across the state, nation, and world who are mothers of Aggies and are interested in being there to support each other, our Aggies and the University. Please enjoy this special depiction of what an Aggie Mom is and how the impact of Aggie Moms is felt by those we serve. View the video by clicking here. The Spring Newsletter has been posted. Click here to view. The Order Form for Aggie Mom labeled wine has been posted. Orders due by March 30th for Family Weekend pickup. Click here to view. The Minutes from the Fall Meetings have been posted. Click here to view. The President’s Transition Report (Word & PDF formats) has been posted. Click here to view. The Winter Newsletter has been posted. Click here to view. Forms B and Y have been posted. Click here to access Federation Forms. Forms A and T have been posted. Click here to access Federation Forms. Winter Federation Weekend Information has been posted. Click here to view. Winter Workshop Information has been updated. Click here for Registration Form. District Meeting Information has been posted. Click here to view. Form F for Boutique Reservations has been posted. Click here to view. Pictures from the Federation Fall Dinner have been posted. Click here to view. The Fall Newsletter has been posted. Click here to view. President Peggy Nolan has announced the Fall Federation weekend information. Click here for more details. Speaker List has been updated. Click here for more information. Template and Instructions for creating Club Bylaws. Click here for more information. Instructions for updating your Club events on the Association Website Mothers’ Clubs Map. Click here for more information. please share your address with us when you donate. 2019 Buck Weirus Spirit Award Winners Named Apr 15, 2019Honor goes to those who make an impact on Texas A&M.